Escape into the backcountry with a Kicking Horse snowmobile tour! 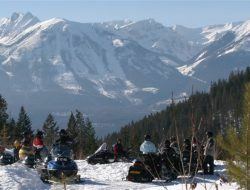 These snowmobile tours depart from Golden, less than 30 minutes away from Kicking Horse ski resort. These snowmobile tours provide all the necessary winter gear, a well maintained skidoo, a highly qualified guide, and a memory that will last forever! The video below is just a snapshot of what to expect on this snowmobile tour. There is no pressure to go fast or slow making this Kicking Horse snowmobile tour very family-friendly. Other Kicking Horse winter tours available are the Kicking Horse Heli-Skiing Tours, Kicking Horse Dog Sled Tours, Kicking Horse Helicopter Scenic Flights, Kicking Horse Snowshoeing Tours, Revelstoke Ski Bus, Cross-Country Skiing and a visit to the Wolf Sanctuary.